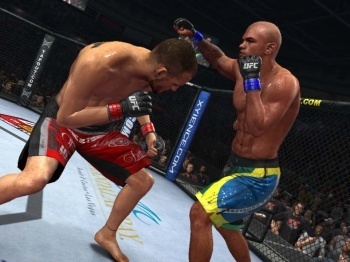 THQ has sold the UFC license to Electronic Arts and closed the studio that was working on the franchise. It was legitimately surprising last night when Electronic Arts revealed its multi-year deal with Zuffa to produce Ultimate Fighting Championship videogames. The franchise appeared to fit THQ's new core-focused strategy reasonably well, but more to the point, UFC President Dana White had previously expressed a few mild reservations about working with EA. "You told us you'd never be in business with us. They wouldn't even take a meeting because mixed martial arts disgusted them. This wasn't a real sport," he said in 2009, in response to the announcement of EA Sports MMA. "I'm not tap-dancing around this thing or whatever. I'm telling you straight-up, I'm at war with them right now. That's how I look at it." He also warned that any fighters who signed up for EA's MMA game rather than THQ's UFC Undisputed "won't be in the UFC." But minds change, and although the move had a certain unavoidable awkwardness to it, White did his best to smooth things over for everyone. "Over the last three years, THQ has delivered best-in-class, all-encompassing experiences to MMA fans, sports enthusiasts and fighting gamers around the globe with its UFC Undisputed series. We want to thank them for their stewardship of our brand," he said in a statement. "We look forward to joining forces with EA to leverage their sports platform, and expand our brand in the video game space." THQ Chairman and CEO Brian Farrell expressed similar enthusiasm and appreciation for the brand but said the move made sense as the company adopts a "more focused strategy." Also helping take the sting out of the loss is the "undisclosed cash payment" made to THQ, which it likely desperately needs. Unfortunately, whether the deal makes sense or not, it's bad news for employees at THQ's San Diego studio, which was working on a new UFC title. With the franchise gone, the studio has been shut down entirely, although THQ is apparently doing what it can to soften the blow. "THQ confirms that today's announcement regarding the UFC license transition will affect the company's San Diego studio," the company said in a statement. "THQ is working closely with those relevant staff to either find possible employment within the company, or potentially with EA."